Following on from Sergeant Gunnhildur’s extraordinary and exciting debut in Frozen Out we find her promoted (but not getting her rightful salary) and working criminal investigations in Reykjavik, Iceland. Gone the easy life of small town and say hello to sleaze and murders in a city still in shock after the great financial shocks of the last three years. 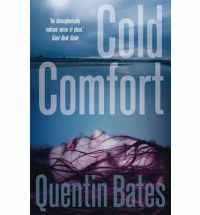 Quentin Bates knows police procedural well and this is an exhausting, but riveting examination of the life of a cop and mother in a cash strapped police force – so poor they have to rent their cars and have no one available to knock on doors. Not even for a celebrity murder. Add an escapee extremely violent con who hasn’t returned to his open prison, Gunnhildur is going to be kept busy. There’s little time for real life or love, which is difficult when there is a teen daughter in the house anyway. Gunnhildur is renowned for being tough and resilient, she isn’t political and resents those who work the system to their own ends. The dead celebrity is a former Fitness Star on TV who seems to have a rather tight knit quota of suitors with political connections. The escaped con is systematically going around wreaking havoc and putting almost anyone he ever knew in hospital. At first there doesn’t seem to be any connection. How could there be? They are from opposite ends of the social scale. But Gunnhildur smokes out a scandal and higher ups want it sat on. She isn’t the sort of woman to sit on anything (unless it’s a chair for another coffee). Quentin Bates writes with authority and feeling for his policewoman and location. You feel he knows Iceland well and the personalities. The plot is very tight, rich in atmosphere, rife with tension. ‘Warning me of what, precisely?’ she asked with a shiver of trepidation and anger. Cold Comfort is a welcome second outing for this Icelandic investigator and you can be absolutely sure you will want to share in the investigation.